Since its start in 1999, the Decatur Craft Beer Festival has granted more than $1,200,000 to Decatur nonprofit groups. 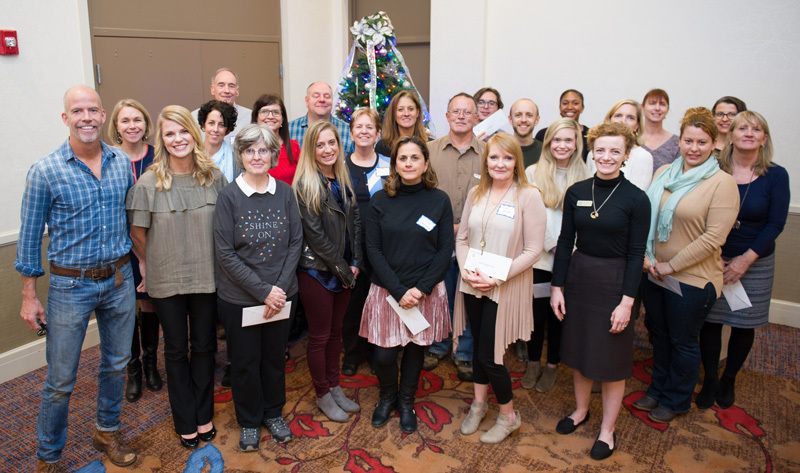 Previous grant recipients include Decatur Arts Alliance YEA!, Decatur Makers, Amplify My Community, and Decatur Education Foundation. Check this page for more information about the grants and to find the grant application for the coming year. Applications should be mailed to the Decatur Craft Beer Festival Grant Committee, Post Office Box 220, Decatur, Georgia 30031 to be received in the Special Events office by the deadline. Check back for 2019’s application information. If you have questions about grants, contact Shirley Baylis. Funds will be used for educational outreach programming at the Decatur Farmers market to teach families to prepare healthy meals on a budget using fresh fruits and vegetables for less than they would spend at a fast food restaurant. TCS supports the growth of adolescents and young adults on the autism spectrum, many of whom struggle to find independence and meaningful employment. The funds will be used to support their efforts in strengthening participants’ ability to manage the emotional ups and downs of becoming an adult. The funds will be used to market a collaboration with the Decatur Downtown Development Authority to give performing artists an opportunity to perform through a revised busking program in the commercial areas of Decatur. Funds will be used to address the disproportionality in academics and behavioral referrals in the City of Decatur Schools. DEF plans to create an equity fund for training and support. The funds will be used for a two part program, including swimming lessons & fitness training to serve 24 immigrant girls from the Global Village School in City of Decatur. Funds will be used to purchase instruments for students who wish to participate in the band but cannot afford to purchase instruments. In 2016, Little Shop of Stories invited the German Exchange Program at Decatur High School to partner with them for the first annual Kidtoberfest: pairing Little Shop’s annual Root Beer Festival with the traditional German festival, Octoberfest. Kidtoberfest is held the Friday afternoon prior to Decatur Craft Beer Festival on Decatur Square. The funds will be used for the 2018 Kidtoberfest. Funds will be used to replace vintage 1945 furnishings with updated desks and seating for volunteers and staff. Decatur’s Martin Luther King Jr. Service project will hold its 16th annual event Jan. 13-15, 2018. The project directly assists low-income senior home owners, who reside in the city of Decatur, by providing house maintenance and repair so that this vulnerable population may remain in their homes safely and comfortably. The funds will be used to continue to provide the services free of charge to the community. The funds will be used to add two customized adjustable-height tables to our collections storage area. The funds will be used to cover the cost of coding robot kits and the special program experience for the new STEM (Science, Technology, Engineering and Math) program series at the Decatur Library. The funds will be used to rebuild and revitalize a tool shed that is in disrepair at Decatur’s Kitchen Garden, as well as to acquire additional landscaping tools needed to maintain the garden. These changes will allow for secure tool storage on site. Haints & Saints Halloween Parade has a mission to present a celebration that crosses age, racial and socioeconomic lines bringing residents and visitors together for an afternoon in downtown Decatur. The goal is to develop a self-sustaining annual event that attracts visitors (and their dollars) to Decatur. The funds will be used for marketing and event insurance. I CARE, Inc. offers support for recruiting and training efforts for new volunteer drivers assisting with free medical transportation for in-need city of Decatur seniors. The funds will contribute to awarding gas cards to volunteer drivers to help defray part of their transportation costs. The funds will be used to provide Literacy Action’s Decatur campus students free access to vision care and glasses if necessary so they can continue to move forward to reach their academic goals. Mead Rd. Mardi Gras sponsors an annual parade and festival in early February to celebrate Mardi Gras and, more importantly, to raise money to fund gifts to the city schools of Decatur music and arts programs. The funds will be used to cover expenses for police presence during the parade. On The Same Page will be focusing on three areas of cultural arts: writing, theater, and music. They will host three different workshops – inspired by themes from this year’s selected book – that will be lead by professional writers, actors, and musicians from the Atlanta area. The funds will pay for workshop materials, professionals’ fees, and for the cost of providing live jazz music at all OTSP events. Funds will be used to purchase classroom materials and supplies for the curricula of the early childhood education programs provided by Our House to homeless children ages six weeks to five years of age. The funds will be used to support training for K-3 CSD elementary school teachers in multi-sensory, systematic, explicit, sequential, and phonics-based instruction. The TEARS Foundation is dedicated to assisting families after a pregnancy or infant loss. They work with local hospitals and funeral homes to reach newly bereaved families in order to assist with funeral expenses of children ages 20 weeks gestation to one year of age. Each family receives $500 for funeral expenses. The funds will be used to assist with the cost of five infant funerals.